The October 2011 issue of 417 Magazine announced your very own Hackett Hot Wings as the #1 wings in 417 land beating out some very notable players. 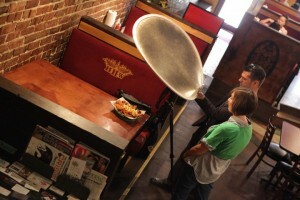 The editors of the magazine joined us for lunch one day and did an amazing photo shoot of our food. We appreciate your support and look forward to bringing you the best wings in the area and thank 417 Magazine for the honor. You can also view the article in our IN THE PRESS area.